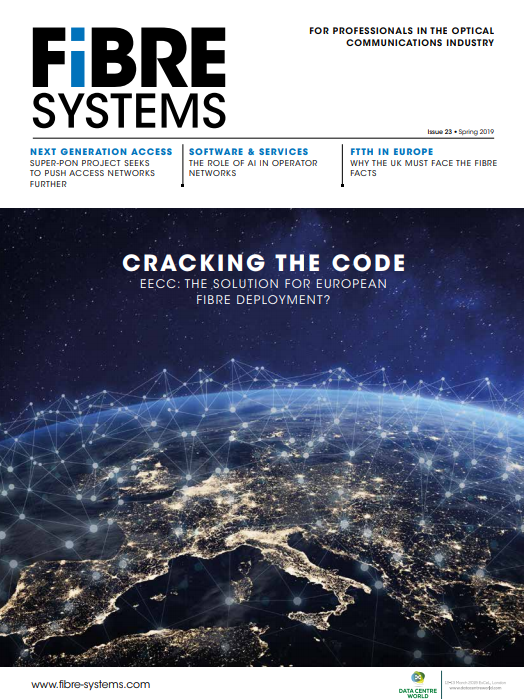 The FTTH Council Europe has revealed the results of a new study which aims to quantify the potential cost savings that could be made by building converged 5G-fibre networks. To support growing traffic demands of 5G and FTTP, BT has chosen to deploy Ciena’s Waveserver stackable data centre interconnect (DCI) platform to increase the capacity connecting its data centres to the UK’s main internet peering nodes. BT’s has plans to deploy 5G in 16 cities in 2019, while forecasting residential broadband growth to remain at roughly 40 per cent annually. This means that significant new capacity is required in all areas of the network, and particularly on the main core links carrying this traffic. The Intel® Silicon Photonics 100G CWDM4 QSFP28 Optical Transceiver product family is expanding! Ericsson has released its latest Mobility Report, which predicts, amongst its findings, that 5G could reach more than 40 per cent of global population coverage, with 1.5 billion subscriptions for enhanced mobile broadband by the end of 2024. Dutch developer of dense wavelength-division multiplexing (DWDM) optical components, Effect Photonics has now completed its second round of financing to accelerate the ramp of its tunable small form-factor pluggable production line and aid development of future technologies. ADVA Optical Networking is developing a commercial device to support the Telecom Infra Project's (TIP) Disaggregated Cell Site Gateway (DCSG) group. Deutsche Telekom and Telefónica Deutschland are collaborating to speed up the expansion of their mobile communications networks, with the connection of at least 5,000 Telefónica Deutschland mobile base stations with Deutsche Telekom's fibre-optic network, long-term. SSE Enterprise Telecoms has entered a fibre agreement with Three UK and O2 to support enhanced fibre access in London. The connectivity supplier is licensed to lay fibre optic cables throughout Thames Water’s waste water network; and the new partnership centres around the use of this fibre ring in enhancing Three UK and O2’s connectivity backhaul capabilities in order to stay ahead of an expected surge in data usage in the run up to 5G.